Antique 1830s KEENE NH Marlboro Street BLOWN 3 MOLD DECANTER Sandwich Sunburst. 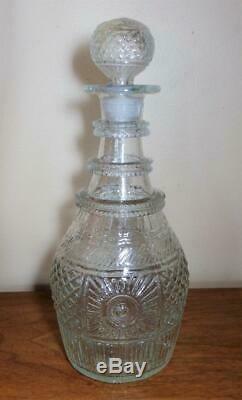 An antique blown three-mold glass decanter in the manner of the Boston & Sandwich Glass Co. But was actually made in Keene, New Hampshire. Attributed to Keene - Mallett - Street Glass Works, dating circa 1820s-1840s. Made of colorless glass (non-flint), with alternating sunburst and diamond quilted panels. Likewise the stopper has a sunburst on the top and diamond quilt pattern around the side. There are 3 applied glass rings on the neck, with doubled edges. The edge of the rings has a knurled effect. Measures 9 inches tall by 3-3/4 wide. The Philadelphia Museum of Art has pretty much the same decanter in their collection, though their example does not have the applied glass rings. No chips, cracks or other damage. The base and stopper have rough pontil marks. Cloudiness in the lower part of the decanter, if any, would be extremely light (I don't think there is ANY cloudiness, but as the glass especially in the lower third shows swirling and some bubbles from the blowing process, it is hard to say there is absolutely none). Any internal imperfections (spots, swirls, bubbles) are part of the character of the glass itself. The surface contact areas on the bottom have lots of fine old wear, though it is hard to see in the photos. NICE piece of truly antique mold-blown American glass. Get Supersized Images & Free Image Hosting. Create your brand with Auctiva's. Attention Sellers - Get Templates Image Hosting, Scheduling at Auctiva. The item "Antique 1830s KEENE NH Marlboro Street BLOWN 3 MOLD DECANTER Sandwich Sunburst" is in sale since Monday, March 4, 2019. This item is in the category "Antiques\Decorative Arts\Glass\Decanters". The seller is "leveille" and is located in Racine, Wisconsin.